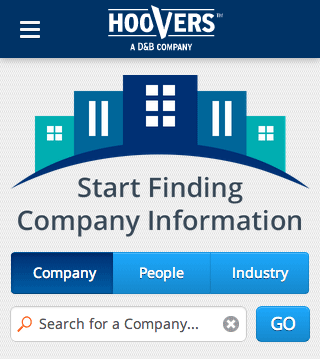 The Hoover’s site added a mobile version in late 2013 with graphic design and user interface elements provided by a third party group and implemented by our web group. The site targeted mobile devices only since there was internal agreement that the big browser site looked fine on tablets. Due to the compressed timeframe for implementation I selected Twitter Bootstrap as the responsive framework to get to market quickly. We also added in responsive styles for tablet should those display features be required in the future. This entry was posted in Portfolio, Web Portfolio and tagged repsonsive.